There may be millions of leaves on some trees, so you simply can't paint them all. Simplification and generalisation again becomes important, but looking and seeing are equally so. Each type of tree is unique, no two are exactly alike, so always study the trees you are going to paint. When it comes to painting trees and foliage, there are two faults that occur time after time. One is lack of observation and the other is muddled brush work. The result is often a stereotyped cardboard cut out of a tree with little thought of light and shade, and branches that are silhouetted in front of the foliage rather than feeding up into it. What I want to do is give you a few of the basic facts about drawing and painting trees, some seemingly self evident but so often ignored when painting. There are of course many different species of trees, and no two trees are the same. But there are certain anatomical points to watch out for when painting trees, and by becoming familiar with them you will avoid the stiff, awkward looking trees that spell 'amateur'. The structure of a tree capers gradually upwards from its trunk two twigs. First of all, the trunk doesn't shoot straight out of the ground, like a telegraph pole, normally some of the roots are visible. The main limbs leave the trunk at an angle of roughly thirty degrees. No two limbs the trunk directly opposite one another, or at the same angle so watch out for this occurring in your painting. The trunk becomes narrower as it divides off into limbs until finally, at the top, there is no trunk at all only a split into the last two limbs. The limbs, in run, split into smaller, thinner branches. Again the branches come off the limbs in a staggered form - never directly opposite one another. The angle of the branches is important. At the top of the tree they leave the limbs at about a thirty degree angle, but as they descend the tree they become more spaced out and the angle becomes wider until, about two third down, the branches are horizontal. At the same time, the length of the branches varies gradually becoming longer as they descend the tree. Each species of trees has its own characteristic silhouette or basic profile. Branch structure is different too. Some trees branches out in a characteristic 'Y' fashion, some in an erratic sickle shape. Another often have a 'U' where the branch joins the trunk. Some branches leave the trunk at night angles, and the lower, heavily weighted down ones even bend under their own weight. These fine twigs are important, because without them the tree appears dead. However, trying to paint every individual twig is both impossible an undesirable. Its better to paint the twigs by applying feathery dry brush strokes in a paler tone. Sky holes are sometimes called "space for the birds to fly through", are often completely ignored. Often quite a lot of sky can be seen through even thickest foliage sky-holes are too very important putting these in also avoids that card board cut-out look. Make a habit of studying the characteristic shapes of various species of trees, taking particular note of their proportions and growth habits. Notice, for example, how tall and how wide the canopy of a tree is in comparison to its lower trunk. A common fault lies in making the canopy too small and constructed, which results in the dreaded 'lollipop' effect group of trees together lose their own identity and unite to make one shape. The common fault here is to overdo the detail on individual trees and foliage groups. I try to resolve trees into two basic tones, putting the lightest tone first and adding the strong darker tone while the first is still damp, keeping in mind where the light source is. Whenever I am painting trees I use a sable hair brush number eight or twelve to paint foliage which forces me to eliminate fussy detail and concentrate on the basic masses. The direction of the strokes depends on the basic character of the tree itself. Notice the trunk its direction, thickness, texture and how lower branches radiate from it. How does it emerge from the ground? When a tree is shown close up, as you see in this painting titled 'the banian tree'. I have used mostly burnt umber, mixture of Prussian blue modelled with light and shade to show the roundness of the trunk. Notice how the trunk is graded from light and warm colours at the base to dark and cool at the top. Observe the strategic 'skyholes' which make the tree look more delicate and graceful. Branches and foliage are massed into groups of light and dark tones so that each one registers strongly against the other. A very thin brush called the rigger is used for painting delicate lines and putting the branches and twigs. The rigger - this brush has very long hair which enables you to, produce, with practice, an enormous variety of widths of strokes depending on the pressure on the brush. 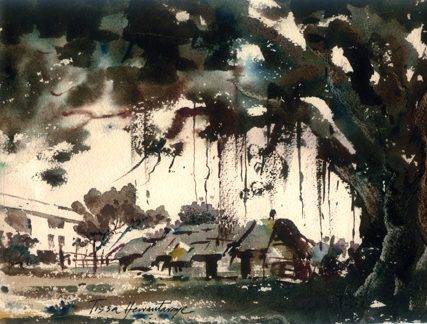 A good watercolour painting of trees is one that looks fresh and spontaneous. The way to achieve this quality is to translate all those complex shapes and textures into a simpler language. In other words, use descriptive brush work to suggest details, instead of laboriously 'reporting' them.